The above document is checked for updates on a monthly basis. However, please note that the above document is currently a relatively short document, because so far there have been relatively few appeal decisions relating to Part 14 Classes A and B of the GPDO. The "Reference Section" section within the above document shows the conclusions for all of the appeal decisions, and indicates how many appeal decisions have supported and contradicted each particular conclusion. The "Appeal Decision Summaries" section within the above document provides full summaries for all of the appeal decisions. 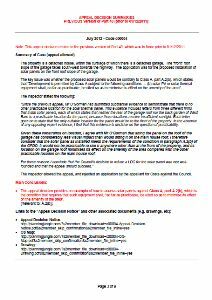 At the end of each summary, there is a link to the appeal decision notice and (if applicable) the costs decision notice. These links only work for members, and there is no extra cost for clicking on them. This means that only members can see the full details of each appeal decision, including the Planning Inspectorate's reference, the site address, the decision date, the name of the local authority, etc. Whenever new appeal decisions are added to the above document, their conclusions are posted on the Updates page of this website (see the category below) and are included within the next version of the Updates by Email (weekly).